Taking a slight break from my usual ramblings. I was interviewed by my best friend, Diane. She and I blog together on MomPopPow.com. She interviews me about my passion for poker. The other day I talked about online players and their avatars and names that they use. I wondered if the players thought that either their avatars or their screen names gave them some extra power or strength. Knowing that many players are superstitious I thought it might be interesting to speculate about in the post. One of my fellow bloggers commented that the names and avatar probably mean nothing once they are chosen. He then suggested that StevieTrips, my name on Full Tilt Poker, an affiliate site, might indicate that I tirp up a lot. He was not too far wrong. Last week I was doing pretty well at picking off bluffs. I could tell that my opponent was betting without the best hand. My bankroll was starting to increase from the 30 buy-ins of $5.00 or $150 and I got it up to about $182 or 36+ buy-ins. But now I am at about $153 or 30 buy-ins. Almost back to where I started. Am I disappointed? Yes, but I only have myself to blame. There were no bad beats, no close races, no miracle cards for my opponent. When I thought I was picking of a bluff, I was instead calling a value bet from an opponent with a better hand. My queens were no match for Aces. My set of 10’s were no match for a flush on the board. I even had a hand where I had AA and entered pre-flop with a pot size bet. The flop was 3 5 A, giving me three Aces or trips. How good was that?. Not really as good as I thought as my opponent was holding 2 4 suited. The opponent may have hope to make a flush. Instead, he hit the straight on the flop for the winning hand and most of my stack. I have yet to learn when to hold them and when to fold them. The good news is that I still have a playable bankroll and I enjoy the game and will try to plug the leaks that I have in my play. It is a good thing that I am not dependent on my earnings from poker as I seem to be stuck. My bankroll needle stands at $171.00 or about 34 buy-ins of A$5.00 each. 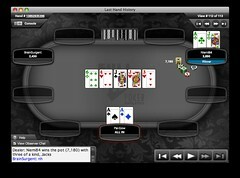 Last night I played in my second Guarantee tourney on Full Tilt Poker, an affiliate site. The last one I attempted had over 2,000 people and I finished in the 600’s or way out of reach of the money that the top 189 would earn. I saw that there was a modest $2k prize to be divided by about 12 or so winners and I chose that one. Of course the game being played was Limit RAZZ which I know but I do not have a very good success rate with. It might have to do what the fact that I play it poorly. In any case, I finished 61st out of 90 players. Still not close enough to cash. What was I thinking. I do play better at No Limit Hold’em Tourneys than I do at RAZZ. I still have a few Step tickets left that I will use to enter some No Limit Hold’em Tourneys. I will attempt to enter a modestly paying event that has less than 200 players. It is not that I don’t like playing a large field, but I feel that I smaller group is easier to work with. I once played a freeroll witn 8,299 players and came it second. Sadly, only 1sr place won any cash. My goal is to increase my bankroll until I have over $500. At that point I will attempt to move up to the $10 buy-in cash games. Do you have bankroll goals? How do you move the needle forward? I play a lot of Rush Poker on Full Tilt Poker, an affiliate link, because I play using my Android SmartPhone. One of the things that I noticed while playing are my opponents names and the avatars that they have chosen. Some of the names are the person’s first name and an initial and/or number to create a unique name. Some of the names are supposed to represent the attributes of the player. Names like DezSpair, lossless1, Da Mad Clown, Bigsexywoman, AllInBlind27 indicate either an attitude or playing characteristic. My name of StevieTrips might indicate that I play hands when I have three of a kind. Like that happens a lot. Some times the avatar chosen makes the statement. A shark, a fish, a lizard, a boxer, or a police officer might also be chosen to convey an online attitude. All of this lends to interesting sessions. Do you believe the names they are using are really like the person behind the mouse controls? Is the avatar supposed to intimidate you into making a wrong play? What do you think when you see your opponent’s avatar and/or name? How does that make you react? 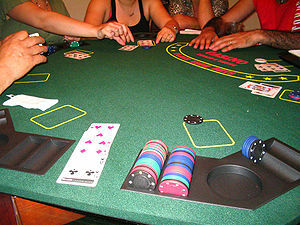 The above definition was supplied from the Poker Tips Website. Grinding is what I am trying to do although at the limits and buy-ins I am playing, I don’t expect poker to be my prime revenue source. My grinding consists of playing poker almost every day for at least an hour or two a day. I play online using my laptop or my Droid SmartPhone on Full Tilt’s Mobile site, Flash 10.x required. When I play on my SmartPhone only Rush Poker on FTP is available. Currently, I have an online bankroll on Full Tilt Poker, an affiliate, of $170 or 34 by-ins of $5.00.. My goal is to get to 100 buy-ins of $5.00 before moving to the next level, $10.00 buy-ins. How do you grind your way up to the next level? What are your goals? In poker there are ways of winning and losing that are more acceptable than others. The best type of win is when you have the absolute best hand, the nuts, and nothing can help your opponent to overtake you. The second best type of win is when you have the best hand, and even though your opponent might have twelve cards left in the deck that could help him, your hand holds up and you win the pot. The third best type of win is bitter sweet and is when you do not have the best hand but you have at least 12 cards in the deck that can give you the win. You get that card either on the turn or on the river for the win. The bitterest way to lose is when your opponent catches his miracle card on the turn or on the river for the win. This is the type of loss that makes you say “that’s poker”. The second worse way to lose is when you have a good starting hand but the flop, turn and river don’t improve your hand and your opponent’s better hand wins. The worst way to lose is when you have a hand that is behind, losing, but you cannot give it up. Even after the river, you call off more chips in the hopes that your opponent was bluffing and nine times out of time you know he is not, yet you call anyway. Yesterday I had yet another losing session and I would like to say that I was beaten at the last or next to last card and that my opponent managed to outdraw me but in reality I beat myself. I called off chips in the hope that my hand was better, in spite of all of the evidence to the contrary. My bankroll went from $182 to $165 or 36 buy-ins to 33 buy-ins. Have you ever given up more chips that you should? Have you ever made a crying call?